Sarah Jessica Parker's new Gap Kids collection is adorable — and affordable! The cute collection celebrates "love, luck and magic." 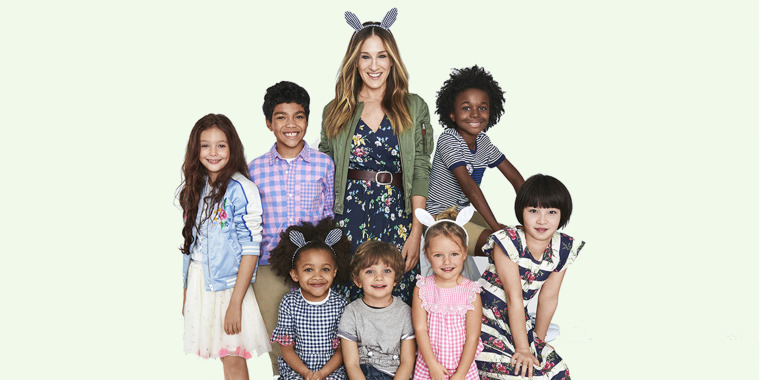 Sarah Jessica Parker just launched a line of children’s clothing for Gap Kids, and it couldn't be more adorable! The “Divorce” actress worked with Gap to design the collection of girls and boys clothing and accessories, available in toddler and kids sizing. The collection, with items ranging in price from $17 to $78, features a mix of whimsical dresses, skirts and graphic T-shirts, along with some versatile basics. Parker played with sweet, traditional patterns like ginghams, florals and stripes. Many of the items include embroidered rabbits or rabbit prints, inspired by Parker’s family tradition of saying “Rabbit, rabbit” on the first day of every month for good luck. “The collection celebrates love, luck and magic,” Gap said in a press release. ... and rabbits with bowler hats and monocles. There's even a bunny-shaped straw purse! Parker drew on her own childhood memories when creating her kids' collection. As someone who grew up in a large family, and as a mom of three children herself, Parker loves clothing that has its own story and endures across generations. "Creating this collection with Gap has been such a treat as a mother, (and) as one of eight children,” Parker said in a release. "I hope the pieces are cherished by the children who wear them, that items are passed down among generations, and that some great memories are created while wearing them." One of the most adorable accessories in the collection is a playful book bag with tons of personality. Parker shared a sneak peek of "Ebbit the Backpack" on Instagram. While the collection is mainly for kids, there are a few treats for Mom, too, including this pretty, belted floral dress. We can't wait until it's warm enough to wear this! The collection will be available starting March 1 on Gap.com and in Gap Kids stores nationwide — just in time for spring!